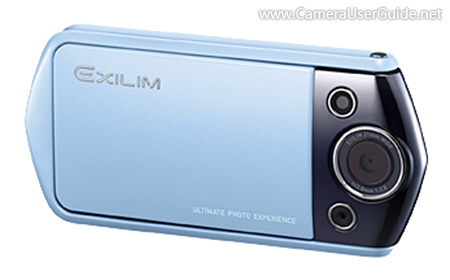 Free Download Casio EXILIM EX-TR10 PDF User Manual, User Guide, Instructions, Casio EXILIM EX-TR10 Owner's Manual. This beautiful Casio EXILIM EX-TR10 camera's lens, LCD display and frame each rotate separately, that permits shooting from virtually any angle. EX-TR10 equipped with a 21 mm super wide-angle lens for group portraits. The 12.1 MP back-illuminated CMOS sensor realizes low-noise, high-quality images even in dimly lit settings. The advance EXILIM Engine HS Ver.3 offers high-speed shooting and high-speed image processing. Besides the shutter button located beside the LCD, there is now a self-portrait shutter button on the frame to enable users to snap self-portraits easily with only one hand. Other highlights include 3.0-inch 920k-dot high-resolution LCD touch screen, 1080p Full HD Movie, Premium Auto Pro, 360-degree Panoramic, Paint function, Picture frames and Brightening Mode give skin a lighter tone and smoother texture. Casio EXILIM EX-TR10 PDF User Manual / Owner’s Manual / User Guide offers information and instructions how to operate the EXILIM EX-TR10, include Quick Start Guide, Basic Operations, Advanced Guide, Menu Functions, Custom Settings, Troubleshooting & Specifications of Casio EXILIM EX-TR10. If you need Casio EXILIM EX-TR10 PDF User Manual / Instruction Guide / Owner's Manual in other languages, please feel free to leave your comments at the bottom of this page.